Below is a chart we put together that shows the REV’IT!-published chest sizes for each jacket’s alpha size along with our estimate of actual max chest and max waist/belly. As you can see, we think the jackets fit just a bit larger than REV’IT’s size chart indicates. This particular style doesn’t taper a whole lot from chest to waist… only about 2”, so most people won’t have to worry about whether the belly area will work for them, but for those who do have an ample belly, we list the max size for each alpha size so you can make sure the size you choose will work. 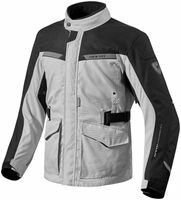 REV’IT!’s new Enterprise jacket has all the basic features you’ll need for winter/spring/fall riding. This jacket is their “entry level” model… it has the basics, but not ALL the bells and whistles like you will see on some of their more expensive models. But I can tell you buy touch and feel, that the basic quality of construction and materials used are comparable to their other higher-end units. It’s a “3/4” style meaning it is longer than sport styles and it will give you more coverage from wind/rain. A longer body allows for some nice pockets too… you have two larger patch pockets in front with rainproof closures, and hidden behind those are two Velcro-close hand warmer pockets. There is also one inside breast pocket. This jacket is made waterproof with a “mid-liner” that is installed permanently between the outer shell and the inside lining. This type waterproofing is the most “fool proof” of all types because it doesn’t have any zippers or other openings through the liner to potentially leak. It won’t flow air though, so that is why I recommend this jacket for spring, fall and winter. It will work great for those seasons and using the included removable thermal liner will make it good in the lower temps too. But in hot weather? Forget it… buy a mesh style to go along with this one. Other nice little things I see? A two position neck closure with a collar which is finished nicely to feel good against your neck; ample reflectives (see our “night shots” in the photo gallery; a full-around stretch cord at the bottom of the torso to help seal out wind/rain; adjustments for the waist and also the sleeve; short rear zipper for attachment to REVIT pants.